Adds the supplied vector to a GameObject's position. The Game Object to move. The vector to add to the GameObject's position. For the time in seconds the animation will take to complete. For the time in seconds the animation will wait before beginning. Can be used instead of time to allow animation based on speed. When you define speed the time variable is ignored. For the shape of the easing curve applied to the animation. For the type of loop to apply once the animation has completed. The coordinate space in which to operate. For whether or not the GameObject will orient to its direction of travel. False by default. For a target the GameObject will look at. Event to send when the iTween starts. Event to send when the iTween finishes. 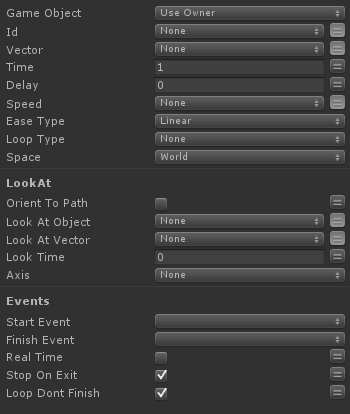 Setting this to true will allow the animation to continue independent of the current time which is helpful for animating menus after a game has been paused by setting Time.timeScale=0. Stop the iTween if the current state is exited. Sets whether a looping iTween should send the finish event. Last modified on 6/12/2018 10:06 AM by User.